What are symptoms of iritis? What are signs of iritis? How do health care professionals diagnose iritis? What are iritis treatment options? What are complications of iritis? What is the latest research on iritis? Where can I find out more information about iritis? Iritis is an inflammatory condition of the eye. In rare cases, it may cause serious damage to the eye. An ophthalmologist must investigate the causes of iritis and initiate appropriate treatment promptly. Health care providers can easily treat iritis, leaving no damage. Iritis is an inflammation of the iris, which is the colored portion of the eye surrounding the pupil. Iritis appears with varying degrees of redness of the affected eye, often with significant pain, sensitivity to light, tearing, and blurred vision. It is usually unilateral, but with some underlying systemic disease processes, it may affect both eyes. The iris is one of three parts of a tissue in the eye called the uvea (the other two parts are the ciliary body located behind the iris, and the choroid at the back of the eye). Uveitis refers to any swelling along the uveal tract. Anterior uveitis and iridocyclitis are other names for iritis. These eye drops and ointments contain a combination of a steroid and one or more types of antibiotic for treatment of infection and inflammation of the eye. The steroid reduces inflammation while the antibiotic treats or prevents infection which may be the cause of the infection. Examples of steroids that are used in these eye drops are hydrocortisone, loteprednol, prednisolone, and dexamethasone. Examples of antibiotics used in these formulations include tobramycin, neomycin, bacitracin, polymixin B, and gentamycin. These antibiotics have different mechanisms of action and two or three may be combined in one formulation. Iritis has many causes. Most of the time, the inflammation is idiopathic (that is, of unknown cause). In these cases, the acute iritis may occur only once in a person's life. Iritis can be associated with a variety of conditions, including several systemic diseases. In these cases, it is often recurrent. Injury to the eye can result in traumatic iritis. Rarely, a history of previous trauma to the other eye can create a delayed onset iritis of the non-traumatized eye. A more posterior uveitis (for example, intermediate uveitis and choroiditis) with inflammatory cells that spill over into the anterior chamber (front part of the eye) can mimic iritis. Similarly, a retinal detachment can create spillover of pigment and cells into the anterior chamber, which could also mimic an iritis. A hypopyon can form, as well. This is a collection of white blood cells that pool in the anterior chamber, typically settling in the bottom half. Sometimes one can see the hypopyon with the naked eye as a layer of white material visible in front of the inferior iris. A hyphema is a similarly located collection of red blood cells that sometimes appears with traumatic iritis. An eye doctor will ask for a patient's complete medical and ocular history and any family history of uveitis. The ophthalmologist will perform a complete eye exam to look for iritis, complications of iritis, and clues that help determine the cause of the iritis. The physician will use a slit lamp microscope to confirm a diagnosis of iritis. The presence of white cells in the aqueous (liquid inside the eye) indicates there is inflammation. By performing a complete eye examination, including dilation to examine the back of the eye, the eye doctor can determine the extent of the inflammation (iritis versus a more extensive uveitis) and look for clues as to the cause. If there is no obvious cause, and it is the first occurrence, no additional testing may be necessary. However, if the iritis is severe or recurring, or if posterior uveitis is also present, the doctor will order additional testing, including blood work and a chest X-ray to rule out an associated disease. The eye pressure can be lower or higher than usual. If it is dangerously high, the eye doctor will need to address this together with the iritis. The mainstay of treatment is steroid eyedrops. With a severe case, a physician may need to inject steroids into the eye, or the patient may need to take steroid orally. If an autoimmune disease is associated with iritis, newer drugs such as immunomodulatory therapy (for example, methotrexate, azathioprine, mycophenolate) and biologic response modifier drugs (for example, infliximab, adalimumab) used to treat the disease may help resolve the iritis, as well. If an infection causes the iritis, anti-infectives (antibiotics, antivirals, antifungals, antiparasitics, etc.) are necessary. An eye doctor also will prescribe a cycloplegic (dilating drop) such as cyclopentolate, which can help relieve much of the pain symptoms. The dilation can also prevent the swollen iris from becoming scarred down and adherent to the lens of the eye, which lies behind the pupil. When portions of the iris become stuck to the lens, they form synechiae. If too many synechial attachments form, the eye pressure can rise to dangerous levels, producing glaucomatous vision loss. If the eye pressure is high (due to the iritis itself or due to synechiae), an eye doctor will prescribe pressure-lowering eyedrops. Usually, iritis clears in days, but it may last for months or become chronic and recurrent. It is very important that a physician recognizes and treats iritis immediately. Patients should continue treatment until the inflammation resolves completely to avoid complications associated with chronic iritis or uveitis. Permanent vision loss is rare but may occur if the retina develops fluid collections called CME (cystoid macular edema) or if high eye pressure leads to glaucomatous damage to the optic nerve. Scarring of the iris to the lens (synechiae) or to the drainage channels in the eye (peripheral anterior synechiae) can lead to acutely or chronically elevated eye pressures, which ultimately may result in glaucoma. Both the iritis itself and the side effects of the steroids used to treat iritis can lead to premature cataract formation. A cataract is a clouding of the eye's lens. 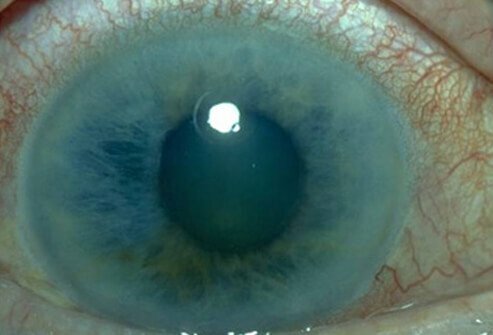 Patients with longstanding iritis sometimes have corneal mineral deposits (band keratopathy). This can lead to both blurred vision and dry eye symptoms. Corneal cloudiness can occur if chronically elevated eye pressure damages the corneal endothelial cells located on the back of the cornea. In most cases, iritis responds to a short course of steroid eyedrops and cycloplegics (dilation drops) with no problems. However, in untreated or recurring iritis and uveitis, the prognosis ultimately depends on the severity, frequency, and duration of the iritis and any resulting complications. Associated diseases or infections may also result in damage to the eye, resulting in chronic pain or vision loss. The field of uveitis includes many inflammatory eye conditions, as well as iritis, and major work is ongoing. Because iritis usually responds so well to treatment, the research primarily focuses on the management of cases that are more severe or involve the eye more extensively. This work benefits our understanding of the mechanism of iritis and the treatment of it. Besides looking for more effective medications, there is also research concerned with looking for the best way of delivering medications to the eye. Please describe your experience with iritis. What were the symptoms of your iritis? Atropine ophthalmic is a drug used prior to eye exams or eye surgery. Atropine widens the pupils, and treats specific inflammatory conditions of the eye, for example, uveitis. Side effects, drug interactions, dosing, storage, and pregnancy and breastfeeding safety should be reviewed prior to using this drug. Heterochromia iridis is a rare condition that describes people with two different colored eyes. There are many potential underlying causes of heterochromia iridis including genetic and acquired conditions. Heterochromia iridis comes in three types: sectorial heterochromia, central heterochromia, and completely heterochromia. The condition is often recognized by a parent (in the case of an affected infant) or by the patient or a family member (acquired heterochromia iridis). Treatment includes addressing the underlying condition or wearing tinted contact lenses to make the eyes look more uniform. The majority of people with heterochromia iridis have an excellent prognosis. Juvenile idiopathic arthritis (juvenile rheumatoid arthritis or JRA) annually affects one child in every thousand. There are six types of JIA. Treatment of juvenile arthritis depends upon the type the child has and should focus on treating the symptoms that manifest. Uveitis is inflammation of the eye. Symptoms include blurred vision, eye pain, eye redness, photophobia, and floaters. Treatment may involve prescription eyedrops, antibiotics, and wearing dark glasses.